It’s been raining all day so I finally broke down and turned the stove on. It’s the perfect day to stay indoors, crank some tunes and putter around the kitchen. I have loads of potatoes and onions from the garden, so got to work this afternoon making a big pot of soup for a late lunch. It’s pretty much a given that if I make a pot of soup and a tray of fresh tea biscuits, all the kids will be at the table for dinner. The smell and taste of warm tea biscuits take me right back to moms kitchen. I have so many memories that come from the foods that she made for us. It’s funny how something as simple as a warm biscuit can bring back all of those feel good feelings that memories hold. Warm biscuits were very much a treat and we slathered them with butter and jam. I somehow managed to get my hands on her biscuit cutter and I’ve kept it in my kitchen for years. I can still hear the quick press of the cutter followed by a little swish as she quickly cut and placed them on the waiting cookie sheet, her hands lightly dusted with flour. I can just close my eyes and see us sitting at that little kitchen table eating dinner. Me, the annoying little sister who was always after the attention of her big brother, and mom explaining to him that he had to say he “disliked” me instead of “hated’ me, when he had reached his limit. I remember warm tea biscuits, homemade cookies and no “midnight snack” if you didn’t eat everything on your plate. Forty years later I’m still holding my ground about those creamed peas on toast. Nope, uh-uh, no way, I would still skip midnight snack if that was on my plate. Sorry mom. And now here I am, doing the same press and swish as mom, while I make these for my gang. I’m using the same recipe, but I’ve replaced the milk with cream because it makes the biscuit so tender and I’ve added two tablespoons of extra shortening to the dough. I always double the recipe, to make up for the handful that immediately disappears as soon as I take these out of the oven. I’d like to blame the teenagers for the missing biscuits, but truthfully it’s usually me. 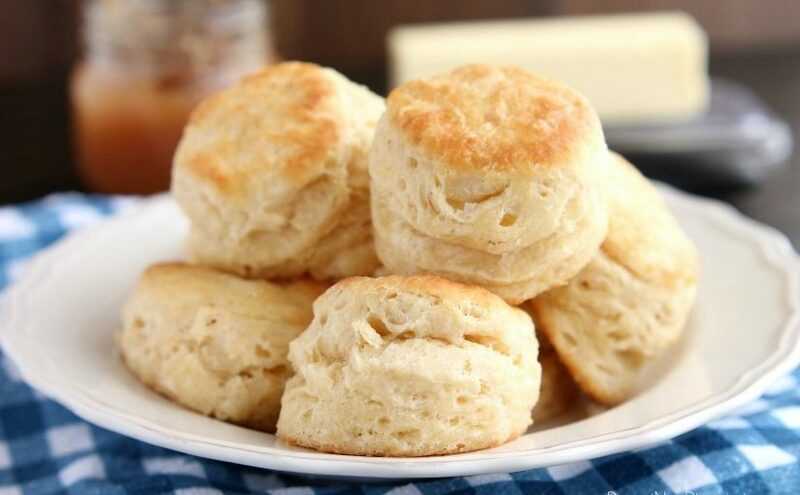 It’s tender and flaky biscuit, melted butter, homemade jam and nostalgia all in one bite. These are equally as good dipped in a steaming bowl of soup or chilli as they are with jam and butter. I love eating the leftovers, if there are any, with a piece of cheese, a dash of salt and pepper and tomato on top. Geez guys, all of this talk has got me missing my parents and brother a little bit. While you go assemble the ingredients for this recipe, I think I’ll go give them a call. Preheat oven to 425° Line a cookie sheet with parchment paper and set aside. In a medium bowl, mix together the flour, baking powder and salt. Cut in the shortening with a pastry blender until it resembles a course meal. Stir in the half and half with a fork, just until the dough holds together. Turn the dough out on to a lightly floured surface, and knead 10 times. Roll the dough 1/2 inch thick on floured surface. Cut with a 2 inch biscuit cutter. Place biscuits on cookie sheet, so that the sides are touching each other, and bake for 14 minutes, or until the bottom is slightly golden. Store leftovers in a tin at room temperature. Enjoy watching the video from below! Red Devil’s Food Cake Like No Other!